The Bobcat-640 is a high-resolution, compact, InGaAs SWIR camera ideal for waste sorting, semiconductor inspection, failure analysis, food inspection, and other specialized quality inspection and high temperature process control applications. 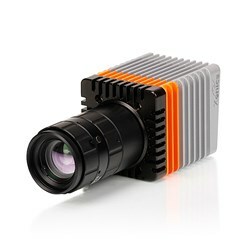 This SWIR Camera is available in two different configurations. The Bobcat-640-CL is ideal for high speed imaging at 640x512 resolution with high frame rates of 100Hz. In its windowing mode, the frame rate can be further increased. This particular camera has a 20 µm pixel pitch, making it compatible with a broad range of C-mount and other low cost lenses. The 640-CL is also compliant with National Instruments’ and Euresys’ framegrabbers. The Bobcat-640-GigE SWIR Camera reduces cost and increases integration ease through a standard GigE Vision interface. Both SWIR Camera configurations feature on-board image processing, a high operating temperature, low noise and low dark current for excellent image quality, and much more.